As Mr. K and Miss E have already pointed out, we have managed to avoid the scourge of scurvy in our survivor group. Additionally, we have avoided most other nutrition-related ailments in the past five years such as rickets. Part of our success has come from our cultivation of a well-tended basement garden. Outdoor gardens are great during the warmer months but also risky and need to be constantly protected. There are roving packs of rabid dogs that will destroy your vegetables and herbs just for the fun of it. There is also the ever-present risk that you will be attacked by zeds as you are picking green beans or watering tomatoes. While I was in the garden one day, transplanting a Pokeweed plant that I had found in the forest, I saw a pack of wild dogs approaching. While I could have taken them out, truth be told, I hate fighting canines. I know they are technically a menace but I still have a soft spot for these creatures who used to be parts of our families in the pre-panic days. So, still clutching the plant, I ran back to the house and slammed the door right before the drooling, snarling group of Laberdoodles reached the yard. Unable to return to the garden for a time, I stuck the plant in a pot in the basement while attending to some other chores. And there it sat for a week; I had completely forgotten it was down there! With so much to do these days, who can keep track of one little plant? The next week while searching for a pair of pruning shears, I was astonished to see that in the cool, semi-dark environment of the basement, the leafy greens had continued to grow. The idea for a basement garden was born. 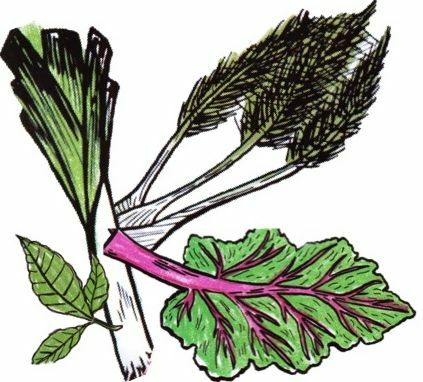 Now we can have fresh greens with our pickled beets and preserved tomatoes in the winter and cut down on the time spent out in the garden during the summer! There’s not even much to do to set up your very own subterranean greenhouse. All you need are a few large pots, some wild greens and herbs and some soil. Voila! You can use the same label-making techniques to identify the plants as you do to organize your weapons! Items that need more abundant sunlight will still need to be grown outside, unless you are lucky enough to stumble across a few grow lights in your raiding travels. I have two grow lights, although Mr. K long ago commandeered one to grow hops for his ‘famous’ homebrew. Enjoy! And remember, if it’s a green leaf, eat it gladly; if its green beef, it’s gone badly.